It’s never too early to focus on upcoming taxes. Naturally, small businesses want to maximize their deductions to minimize taxes. However, they might not be aware of a certain tax code that benefits them: Section 179. 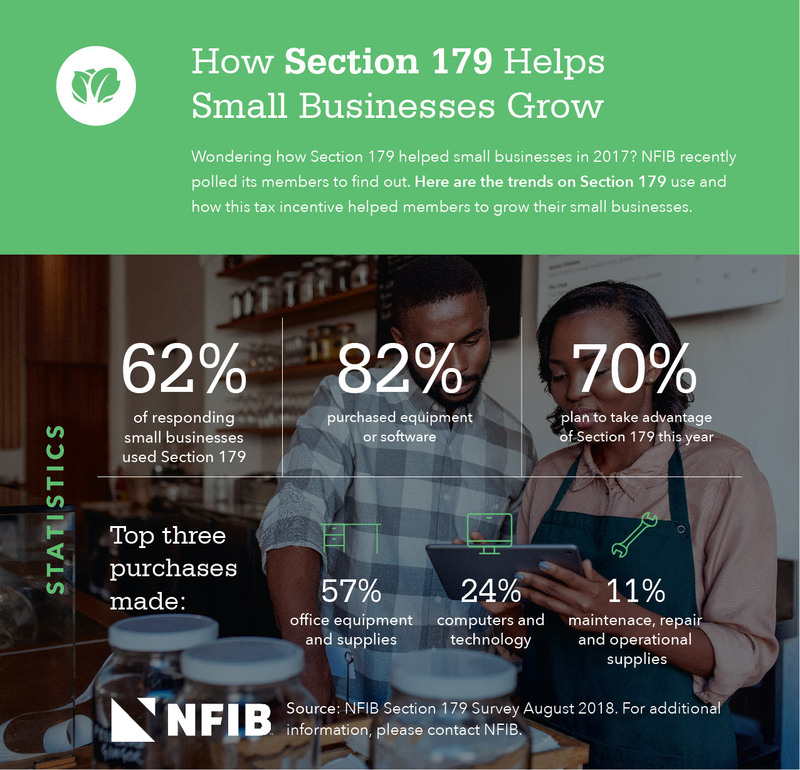 According to a survey conducted by the National Federation of Independent Business (NFIB), 70 percent of small business owners plan to take advantage of Section 179 this year. If you’re a bit unfamiliar with Section 179 or what qualifies under it, this guide can help you take advantage of applicable deductions to solidify a strong growth for the future. Section 179 applies to deductions for business depreciation of property. It won’t increase the overall deduction you can take, but it gives small businesses an option to take their deduction more quickly. In some cases, an asset’s useful life could stretch out over a maximum of 39 years. With Section 179, a company has the option to declare the entire deduction in one year instead of spreading it out over many years. If the useful life of the appliance is five years, straight-line depreciation would cause the business to only deduct a portion of this expense each year for five years. Under Section 179, the restaurant could deduct the entire expense in the first year. Newer small businesses that have to invest in a lot of assets right away can take advantage of the deduction right away. It can also help established businesses make decisions about purchasing new assets that could help their company grow. Even though the purchase may cause the business to spend a lot up front, the tax impact might help ease the burden initially. Currently, there is a deduction limit of $1,000,000 and a total investment limit of $2.5 million. These limits are indexed to inflation, so they could change somewhat in the coming years. Many small business owners are generally familiar with some of the small business tax deductions that can help you save money at tax time, but did you know about Section 179? This tax deduction expands to a deduction limit of $1,000,000 level and is permanently at this level until further notice. This tax break for small businesses is intended to make it more affordable for small companies to buy business equipment, such as office furniture, vehicles, computers, machinery and other tangible capital investments, by allowing businesses to deduct up to $1,000,000 per year in qualifying business equipment purchases from their taxable income. Section 179 has been around for several years, but the levels and availability of this tax deduction had been fluctuating. When it was first introduced, Section 179 deductions had an annual limit of just $10,000. Congress kept raising the limit year after year, but then in January 2015, the limit dropped from $500,000 to $25,000. However, the Protecting Americans from Tax Hikes Act of 2015 (PATH Act) allowed the return of the $500,000 limit to help resolve any uncertainty about the rules for this type of small business tax deduction. With the passage and signing of the H.R.1 law (The Tax Cuts and Jobs Act), the deduction limit was increased to $1,000,000 in January 2018. While businesses were already allowed to deduct the value of eligible business equipment purchases, they could only deduct a portion of the purchase’s value each year. However, with Section 179, your small business can deduct the full value of certain business equipment purchases in the same tax year that the purchases are made. This alleviates the pain of depreciating (or deducting the amount in portions) on a year-by-year basis over the useful lifetime of the equipment. This advantage can be huge for your small business, as it can potentially reduce your taxes by larger amounts each year. No more waiting several years to get those full tax benefits of your equipment purchases! 78 percent of small businesses used Section 179 to offset their tax expenses. 82 percent purchased equipment or software last year (cars, trucks, office furniture, machinery, etc.). 35 percent of small business owners are unaware that they’re eligible for deductions under Section 179. The top three purchases made were computers (51 percent), vehicles (44 percent) and office furniture (31 percent). 75 percent made qualifying purchases of less than $50,000. Section 179 has a $1,000,000 limit on the total amount of business property expenses that can be deducted per year. Section 179 can only be used for new or used property that is purchased by your business – not for leased or rented property or property that is received as a gift or inheritance. This deduction is highly focused on small and medium-sized businesses because the only companies that qualify for Section 179 are ones that spend less than $2.5 million per year on qualifying business equipment purchases. Starting in 2018, Section 179’s $1,000,000 annual deduction limit and $2.5 million business investment limit will be indexed for inflation – so the number of deductions will continue to adjust slightly each year along with overall prices in the economy. Which kind of property qualifies for Section 179? You can also apply this rule to new or used property that you purchase from another party. Any property you purchase for your small business must be used at least 50 percent of the time for business. For example, let’s say you purchase a new computer for your design firm. You must use it primarily for your business to qualify. If you find yourself using it to check personal emails from time-to-time, it won’t be disqualified. Just ensure you use it mostly for business-related issues. Any property meant for use outside of the U.S.
You also may be able to qualify for Bonus Depreciation. Up until 2017, Bonus Depreciation only covered new equipment. Now, it has been updated to include both new and used equipment. Bonus Depreciation is useful for larger businesses spending more than Section 179’s spending limit. In 2018, the Bonus Deprecation was raised to 100 percent and is made retroactive to September 27, 2017 and good through 2022. If you’re still unsure if your equipment qualifies, visit the official Section 179 informational website. Are you ready to file your small business taxes? If you run a small business, you can also use software to help prepare your own taxes. In other cases, it may be best to hire a tax professional to help you make sure that you don’t have problems and ensure that you take advantage of all of the applicable business deductions. If you have to file an extension, you still have to pay what you owe on time. Otherwise, you could face steep penalties. In certain situations, you may also consider looking into funding to help you cover an extension or any other tax bills. If you’re still unsure of how Section 179 can benefit your small business taxes, check out this webinar by NFIB for more information. Tax rules can impact major business decisions. As a small business owner, you should make researching these rules part of your job or do due diligence to find a tax professional who can assist you. Prioritizing your small business taxes will not only prevent unexpected expenses but can help you more efficiently and effectively run your business year-round.